My mobile karaoke disco which includes full video playback of the songs is on offer to customers throughout Merseyside, and large parts of Cheshire. This includes Liverpool, and the Wirral. The types of function I cater for are Weddings, Corporate Events, 60's & 70's Nights, Birthday Parties, Kids Parties, Anniversaries, the list is endless. A few notable events which I did were the Labour Party Convention in Concert Square in late 2016, SoundCity for the Arts at the Gladstone Dock, and the NUS Convention at Liverpool University, the latter two were in 2017. 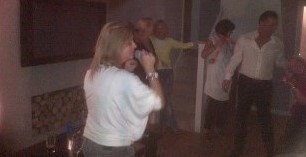 I am well known for karaoke however I also have high quality dj skills. This is the Labour Party Conference Karaoke and the highlight of the evening had to be when I played their old song "Thing's Can Only Get Better"..they all went hyper! The Liverpool Ukulele Orchestra in Huyton for Ian's birthday party with the help of my pa system. It was a challenging bit of mixing! Notice the Bee Gee's video and birthday greeting text on the projector screen. That is what a video disco is all about plus you can provide photos for a family slideshow. I was in Cheshire for Simon Gregson whose wife Emma had her 30th birthday party. He plays the part of the much loved Steve McDonald in Coronation Street. It was a fun night for all with lots of entertainment, including a rodeo horse ride! Steve, and his pal Kev finished the karaoke with a fine rendition of Uptown Girl. Above you can see Tricia Penrose (Gina in the TV series Heartbeat, and also Big Brother) singing. See www.triciapenrose.co.uk/. Anyway Tricia is a lovely, and talented lady who passed the kind comments "you will get more bookings", "you're really on the ball", "the system you use is very good" and "those are good speakers". Kind words from a professional. Interestingly, Tricia's husband Mark was asked to join Take That, and refused! Anyhow he is a very successful businessman, and TV presenter. Over the last 25 years I have gained a great deal of experience playing for a wide variety of different types of people. I am comfortable with most genres of music ranging from the 1920's through to current UK charts. The sophisticated technology I use enables high quality mixing of club and house music. Even country and western sometimes make an appearance on my play-list. Large music libraries backed by quality equipment then complete the ingredients necessary for a quality mobile karaoke disco. Games such as musical statues, bumps, chairs, and pass the parcel with prizes for the winners. The ever popular balloon modelling. Children's disco music like Bob the Builder, The Music Man, Superman and Agadoo. Some youngsters may be tiny but they often sing brilliantly on my karaoke! I'm CRB checked/cleared which sadly has become quite an important issue. Very competitive prices are on offer to customers in Liverpool, the Wirral and Cheshire. I am very reliable, and meet the requirements of most hotels and function rooms with my DJgaurd public liability insurance and St.Helens Pat Testing. Feel free to browse my website or give us a call without any obligation. Whatever you want were here to please customers in Liverpool, the Wirral and Cheshire! Using the latest subscription streaming technology from Atomix, the makers of VirtualDJ 8, I can download most of those difficult to find high quality songs even in the middle of your party! A great party does not happen accidentally. The main issue is the choice of venue. A rectangular venue with a stage, or DJ booth on the back wall is ideal. Real walls are important to contain the music, glass buildings allow it to fade away. You must accurately predict how many people will turn up for your party, and match it to the size of your venue. A huge venue and few people equals disaster. The DJ’s placing of his karaoke singers, rig, and speakers is again critical for best performance. They should not be in a second best place to a buffet. Anyway the true stars are the hosts and their guests. Anything that can be offered in the lines of a party piece is excellent. For instance grandad singing My Way on the karaoke is great! However don’t over do the party pieces, people also want to dance, and listen to their favourite tunes. What you are trying to do is add variety to your party, and keep things entertaining for a wide variety of people of all ages. Songs fit together like the pieces of a jigsaw, they should be matched by beat, key and mood for best effect. Always give the DJ enough freedom to ensure matching songs are mostly played. I always sort a play-list into groups of songs which sound good together. It is also important that the music suits the people, and the DJ has good karaoke disco equipment.